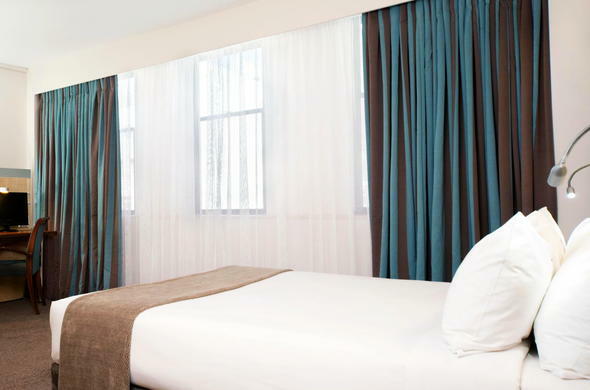 Holiday Inn Express Cape Town City Centre accommodates guests in one of 172 comfortable rooms with modern amenities to ensure a pleasant stay. This Cape Town central accommodation offers three different options, guest rooms, executive club level and suites. In total there are 172 contemporary-style rooms. The hotel comprises 13 floors and has 151 single-bedded rooms, 24 double-bedded rooms and 2 universally accessible rooms. 115 non-smoking rooms. All of the rooms feature television sets with satellite reception, coffee and tea making facilities, work desks with lamps, direct dial phones, private en-suite bathrooms, hairdryer, individual air conditioning, Internet access and in-room safes. The guest rooms also have sleeper couches and are non-smoking.